Have you heard of Skyr? Skyr is a dairy product and it has been an integral part of Icelandic culture and cuisine for centuries. High in protein, low in fat and with a delicious creamy taste and texture, Skyr is something you need to try if you have not done so already. The dairy product can also be used in baking and add a delicious touch to cakes and bakes. Ísey Skyr asked us to come up with a recipe using their delicious products and I am so, so pleased with the results. 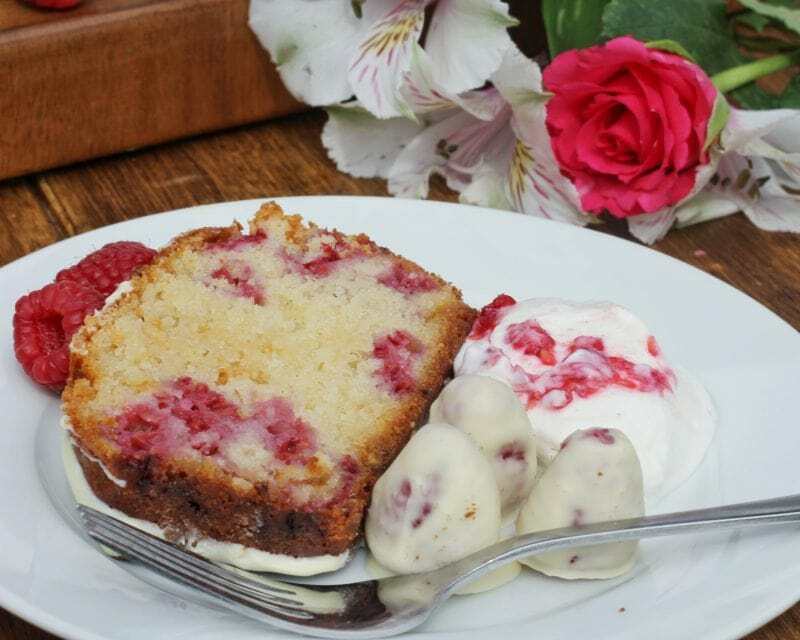 This Raspberry and White Chocolate Skyr cake uses Vanilla Ísey Skyr and it is absolutely divine – a real show stopper but with minimal effort. 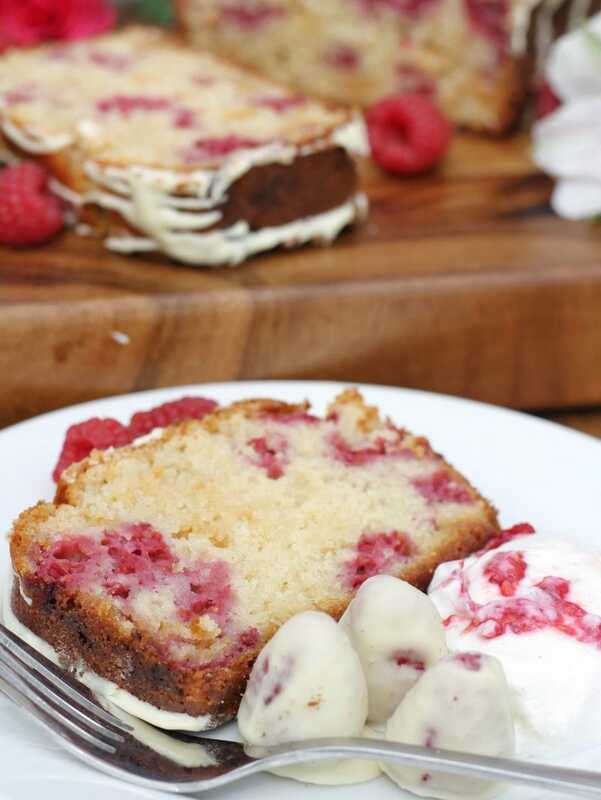 The creamy skyr makes the cake deliciously moist and the vanilla flavouring goes perfectly with the tartness of the raspberries and the sweetness of the chocolate. 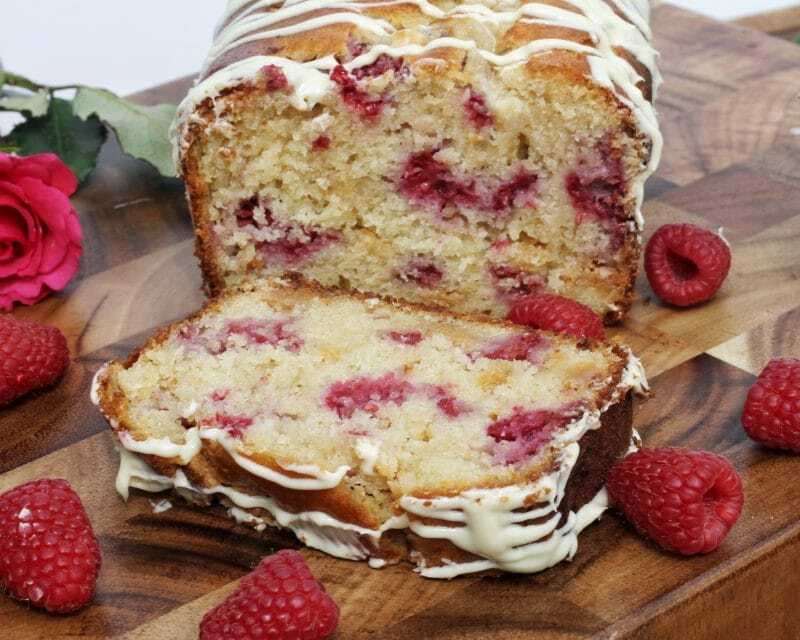 This cake looks impressive and tastes indulgent but is incredibly easy to make. You can serve with a generous scoop of skyr on the side too. Firstly, preheat the oven to 180 degrees, or 160 for a fan oven (gas mark 4). Grease and line a 2lb (900g) loaf tin with baking paper. In a large bowl, cream together the butter and the sugar until they have a fluffy consistency. Next, add the eggs, vanilla essence and skyr. Beat with an electric whisk until combined. Sieve the flour and carefully fold into the mixture. Add the white chocolate chips and raspberries. Take care to halve the raspberries carefully with a sharp knife beforehand. 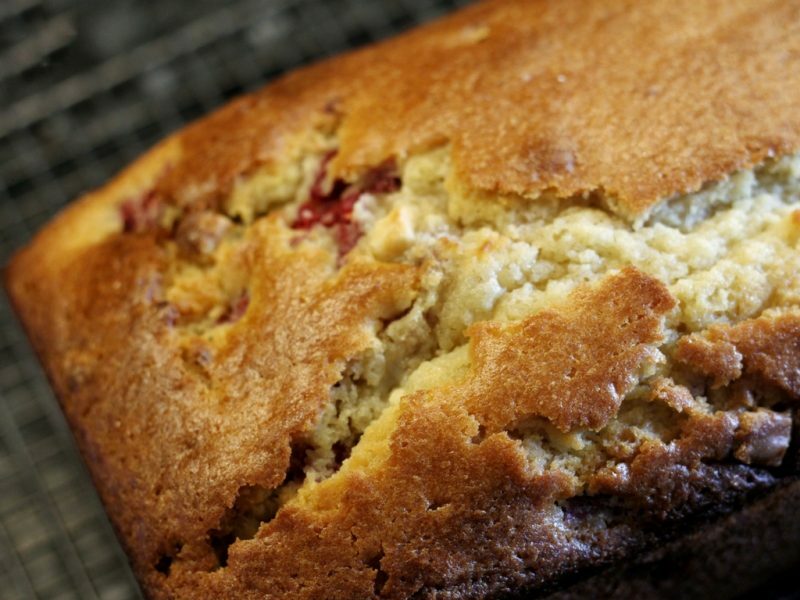 The whole raspberries are a little heavy for the mixture and sink to the bottom of the cake. When halved carefully without breaking they should distribute around the cake nicely. Stir the cake mixture carefully, takeing care to evenly spread the chocolate chips and raspberries without breaking them up. Bake in the oven for around 1 hour. After half an hour, check on the cake and cover with tinfoil to stop the top browning further. The cake may need up to an hour and 10 minutes to fully bake. A skewer or knife should come out clean when it is ready. Leave to cool in the tin until it is safe to touch and then turn out onto a rack until completely cool. Meanwhile, melt 75g of white chocolate in a heatproof bowl resting over a pan of simmering water. Once the chocolate is completely melted, and the cake is cool, drizzle the chocolate over the top of the cake. Chocolate may run down the sides of the Skyr cake but that is fine – you can be as messy as you like! Once you have covered the cake in dribbles of chocolate, again wait to cool. You can cover any left over raspberries in spare chocolate. They look great served with the cake and a generous helping of Ísey Skyr on the side. The combination of being high-protein, low-fat, and having a high proportion of nutrients, makes Skyr the ideal snack at any stage of life. The calcium is great for kids’ growth and helps combat osteoporosis. It is great for those who have an active, healthy lifestyle and are conscious of what they eat. Ísey Skyr uses high-quality ingredients (Icelandic water and milk) and is free from pesticides. Ísey Skyr is made with 3-4 times more milk than typical yoghurt and with the original Icelandic skyr cultures, via the innovative MS Iceland Dairies production process. 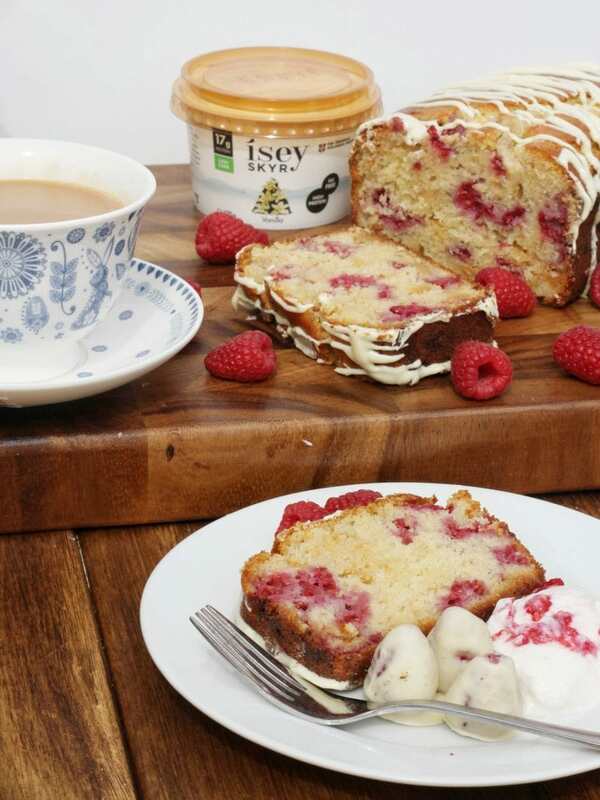 Ísey Skyr is available at ​Waitrose​ in the following flavours: Blueberry, Vanilla, and Strawberry (170g pots). Ísey Skyr is also available at selected ​Aldi UK​ stores in the following flavours: Blueberry, Vanilla, Strawberry and Mango (170g pots). Vanilla Ísey Skyr makes a divine accompaniment to this cake, as well as forming part of the recipe. 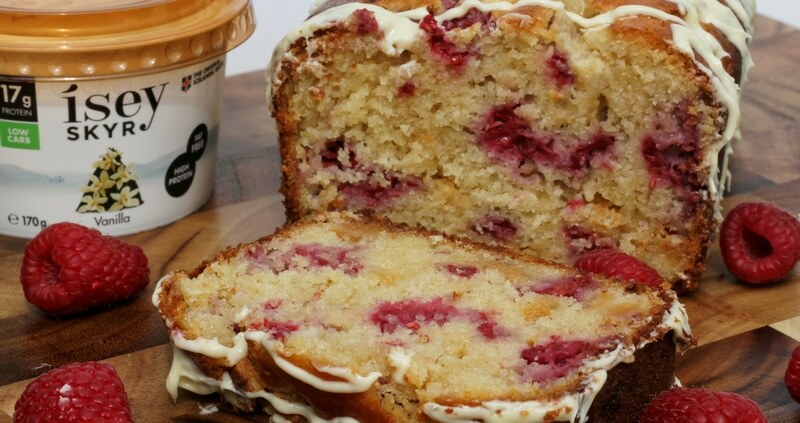 The flavours and texture compliment the raspberries and white chocolate perfectly. 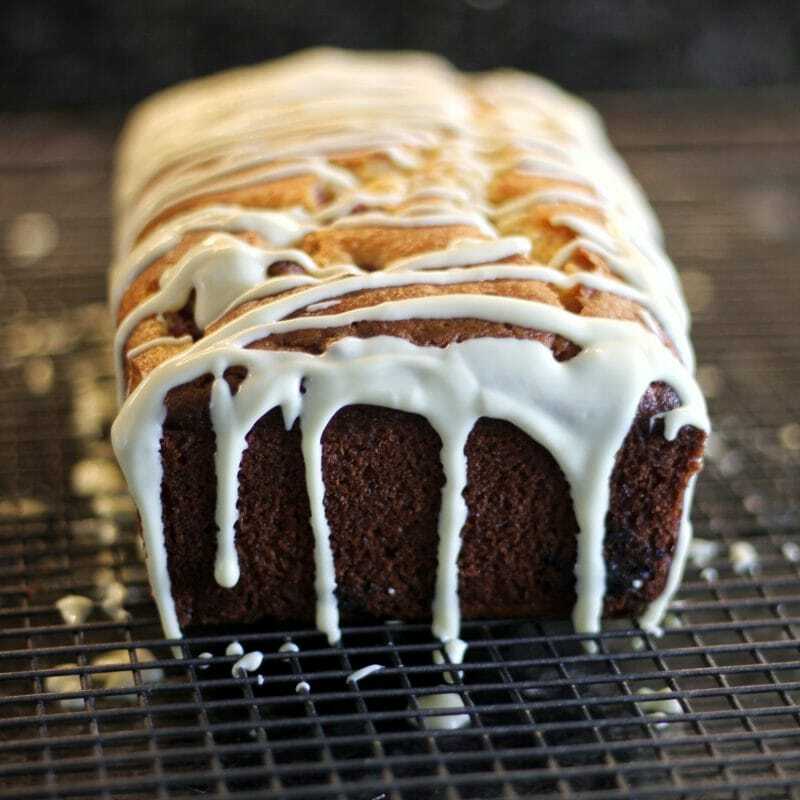 This Skyr cake looks and tastes impressive but is so simple to make. It is one of our new family favourites. Please note, this is a paid collaboration with Ísey Skyr. I love raspberries. this cake looks delicious. I’ve not heard of skyr but it sounds interesting.